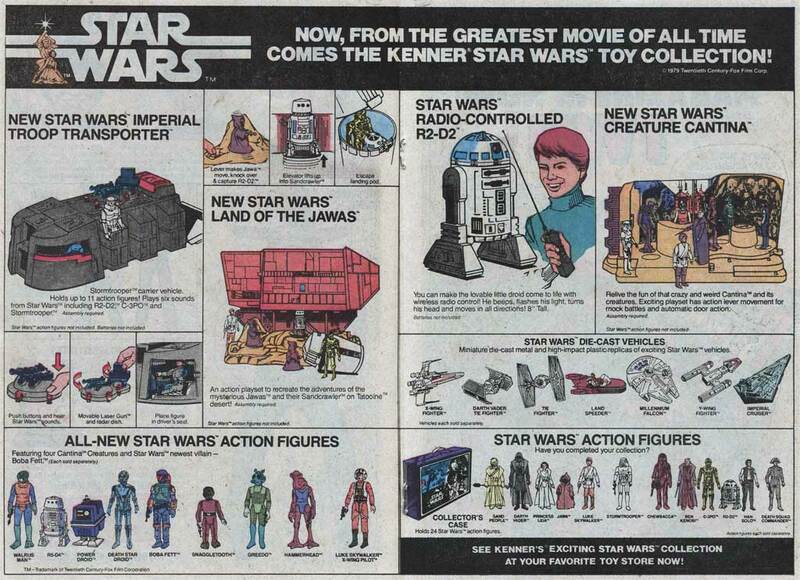 Check out this advertisement for Star Wars toys available from Kenner. This ad appeared in comic books in late 1979. I owned nearly all of these toys. The only item on this page I didn’t own was the Imperial Troop Transporter (it wasn’t in the film, so I wasn’t interested). Given the amount of Star Wars product on the market today, it’s hard to remember a time when there wasn’t much available. The idea of owning all Star Wars products nowadays is nearly inconceivable. Ahhhh… the good ole days. I wonder if license-holders make conscious decisions about juuuuuust how far they can push their luck with customers. This ad got me SO excited when I first saw it in a comic! I love this ad! I just noticed that you posted this and then I posted the exact same ad on my blog like three weeks later. Yikes! Sorry if I look like a copycat! Great minds thinking alike, I guess!